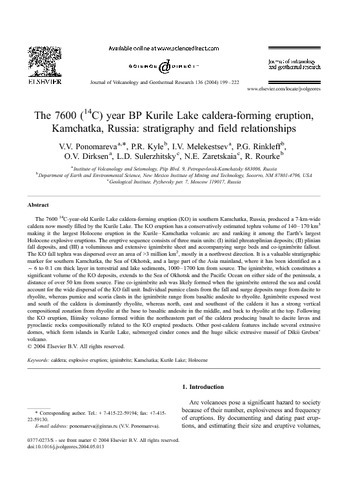 The 7600 14C-year-old Kurile Lake caldera-forming eruption (KO) in southern Kamchatka, Russia, produced a 7-km-wide caldera now mostly filled by the Kurile Lake. 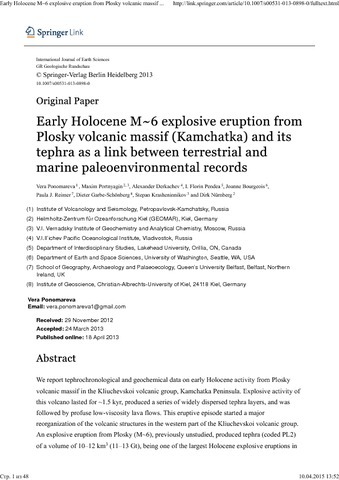 The KO eruption has a conservatively estimated tephra volume of 140–170 km3 making it the largest Holocene eruption in the Kurile–Kamchatka volcanic arc and ranking it among the Earth’s largest Holocene explosive eruptions. The eruptive sequence consists of three main units: (I) initial phreatoplinian deposits; (II) plinian fall deposits, and (III) a voluminous and extensive ignimbrite sheet and accompanying surge beds and co-ignimbrite fallout. The KO fall tephra was dispersed over an area of >3 million km2, mostly in a northwest direction. It is a valuable stratigraphic marker for southern Kamchatka, the Sea of Okhotsk, and a large part of the Asia mainland, where it has been identified as a f6 to 0.1 cm thick layer in terrestrial and lake sediments, 1000–1700 km from source. The ignimbrite, which constitutes a significant volume of the KO deposits, extends to the Sea of Okhotsk and the Pacific Ocean on either side of the peninsula, a distance of over 50 km from source. Fine co-ignimbrite ash was likely formed when the ignimbrite entered the sea and could account for the wide dispersal of the KO fall unit. Individual pumice clasts from the fall and surge deposits range from dacite to rhyolite, whereas pumice and scoria clasts in the ignimbrite range from basaltic andesite to rhyolite. Ignimbrite exposed west and south of the caldera is dominantly rhyolite, whereas north, east and southeast of the caldera it has a strong vertical compositional zonation from rhyolite at the base to basaltic andesite in the middle, and back to rhyolite at the top. Following the KO eruption, Iliinsky volcano formed within the northeastern part of the caldera producing basalt to dacite lavas and pyroclastic rocks compositionally related to the KO erupted products. Other post-caldera features include several extrusive domes, which form islands in Kurile Lake, submerged cinder cones and the huge silicic extrusive massif of Dikii Greben’ volcano. Shiveluch Volcano, located in the Central Kamchatka Depression, has experienced multiple flank failures during its lifetime, most recently in 1964. The overlapping deposits of at least 13 large Holocene debris avalanches cover an area of approximately 200 km2 of the southern sector of the volcano. Deposits of two debris avalanches associated with flank extrusive domes are, in addition, located on its western slope. The maximum travel distance of individual Holocene avalanches exceeds 20 km, and their volumes reach ∼3 km3. The deposits of most avalanches typically have a hummocky surface, are poorly sorted and graded, and contain angular heterogeneous rock fragments of various sizes surrounded by coarse to fine matrix. The deposits differ in color, indicating different sources on the edifice. Tephrochronological and radiocarbon dating of the avalanches shows that the first large Holocene avalanches were emplaced approximately 4530–4350 BC. From ∼2490 BC at least 13 avalanches occurred after intervals of 30–900 years. Six large avalanches were emplaced between 120 and 970 AD, with recurrence intervals of 30–340 years. All the debris avalanches were followed by eruptions that produced various types of pyroclastic deposits. Features of some surge deposits suggest that they might have originated as a result of directed blasts triggered by rockslides. Most avalanche deposits are composed of fresh andesitic rocks of extrusive domes, so the avalanches might have resulted from the high magma supply rate and the repetitive formation of the domes. No trace of the 1854 summit failure mentioned in historical records has been found beyond 8 km from the crater; perhaps witnesses exaggerated or misinterpreted the events. Very few age controls exist for Quaternary deposits over the vast territory of the East Russian Arctic, which hampers dating of major environmental changes in this area and prevents their correlation to climatic changes in the Arctic and Pacific marine domains. We report a newly identified ~177 ka old Rauchua tephra, which has been dispersed over an area of >1,500,000 km2 and directly links terrestrial paleoenvironmental archives from Arctic Siberia with marine cores in the northwest Pacific, thus permitting their synchronization and dating. The Rauchua tephra can help to identify deposits formed in terrestrial and marine environments during the oxygen isotope stage 6.5 warming event. Chemical composition of volcanic glass from the Rauchua tephra points to its island-arc origin, while its spatial distribution singles out the Kamchatka volcanic arc as a source. The Rauchua tephra represents a previously unknown, large (magnitude >6.5) explosive eruption from the Kamchatka volcanic arc.